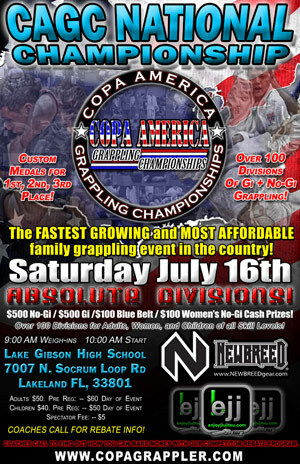 Saturday July 16th, 2011 Copa America Submission Grappling Championships will be in Lakeland, FL at Lake Gibson High School for the Copa America National Championships. Absolute Divisions! $500 No-Gi / $500 Gi / $100 Blue Belt / $100 Women's No-Gi Cash Prizes! Custom medals for all Divison Placers! Coaches call to find out how you can make money with Copa America on our competitor rebate program. Contact Ross Kellin at (863) 859-5566 to participate in the program.